As a marketer, chances are you’re constantly struggling to pinpoint your messaging, cut-down texts, and choose the perfect call-to-action (CTA) for every campaign. However, what you aren’t realizing is that when your entire marketing campaign relies solely on textual communication, you’re very limited. Essentially, all you have to work with is a short message that can motivate your audience to take one specific action. In comparison, personalized videos enable you to achieve goals in 4 different dimensions in one single campaign. While this approach offers more benefits and opportunities, it also makes measuring the success of your campaign more complicated. Business is perhaps the most important KPI set of all. This set of metrics shows the overall impact of your video project, and are mostly dependent on the success rate of the video in terms of driving the audience to take an action – such as clicking on the CTA button at the end. The most crucial business KPI you need to measure is conversion rate. Every video should end with a CTA, inviting the viewer to perform a desired action. The CTA sums up the reason for building and executing the campaign – and can be used for actions such as: changing subscription plans, downloading a mobile app, activating an online account, filling out missing information or purchasing a complimentary service. Similar to any other marketing campaign, personalized video programs are also measured by conversion rates. If your viewers aren’t engaged – your business won’t grow. While the distribution channels of personalized videos are varied and include, among others, the customer’s own e-portal, social media, text messaging, pre-rolls and more, email is still the most common and the most vital one to track from an engagement perspective. What are the 3 key factors that make up video engagement? Open Rate: How many people in your campaign’s target list opened the email, which contained the personalized video? While on average, the word “video” in a subject line boosts open rates by 19%, when the subject line mentions that the video is personal, email open rates reach their peaks. Viewing Rate: After your email is opened, what percentage of recipients actually clicks through to watch the video? 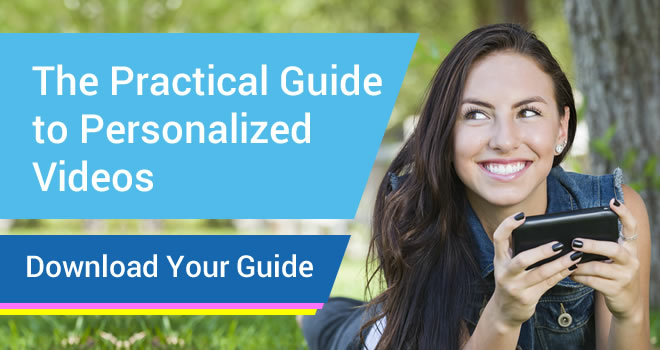 This is where personalization starts to make a difference. While mass marketed videos have a relatively low viewing rate, typically, with personalization, the viewing rates for videos are greater than 67%. Video Completion Rate: Here is where we see personalization’s biggest impact. Thanks to personalization, most viewers will watch the video until the end. One of the key goals of any video marketing campaign is to get viewers to like your company and brand more than they did before. This can translate into greater loyalty and customer retention. Net Promoter Score (NPS) –Would your customers recommend you? Knowing what percentage of your customers are promoters, detractors or neutral can help you identify brand advocates as well as customers that may require additional attention to improve their relationship with your company. Customer Satisfaction Index (CSI) – This is usually measured by the answer to the question: Would you like to receive such videos in the future? The best way to figure out whether or not you’re hitting the mark is simply to ask your viewers what they think. Including a survey at the end of your video is a great way to measure viewer satisfaction and figure out what changes you need to make so your next campaign will be even more successful. Churn Rate/Retention: Whether it’s through video or another personalization project, reaching out to your customers in any form should have one main goal – making sure they stick around. Decreasing churn rate and increasing retention should be the goal of every client-facing initiative. Finally, though many marketers like to skim over these specifics, it is vitally important to understand the technical aspects of your marketing campaign. What was your user’s average response time? Were there any glitches along the way? For example, did specific devices have issues playing your videos or rendering your links properly? Which age groups are more engaged with your videos? Knowing these facts will help you familiarize yourself with your audience, refine your messaging and offers and increase user engagement and the overall effectiveness of future campaigns. To summarize, in the crowded online world of indifferent customers, personalized videos have the exclusive power to drive results in 4 different dimensions simultaneously. Knowing how successful you are in each of these dimensions will help you form future personalized video campaigns and that can measured by B.E.S.T. KPIs.